I have somehow made it to 33 years old without ever eating hummus. Okay– I have a pretty good excuse: I am allergic to chickpeas (little known fact: peanuts (my most severe allergy) are actually in the same family as soybeans, lentils, and peas, not tree nuts like walnuts and almonds). 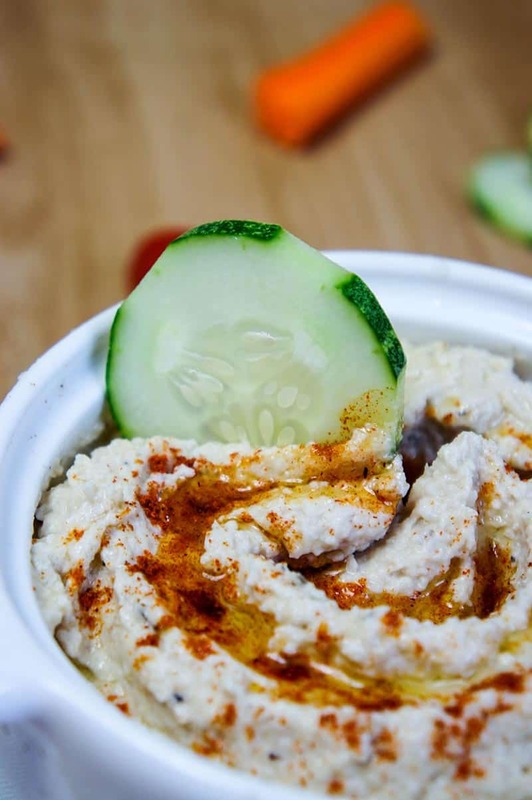 I have watched people dip veggies in hummus in delight, spread it on sandwiches, and eat it off spoons, and always wished that was something I could try. It has always seemed like such a great high protein snack option. And I found out last week just how great it really is. I can see a lot of variations coming out of this recipe– a basil pesto white bean? Roasted red pepper? I think the possibilities are endless. If you’re trying to amp up your veggie intake– take a container of this and a huge bag of raw veggies in your lunch. I guarantee that bag will be empty before you come home. 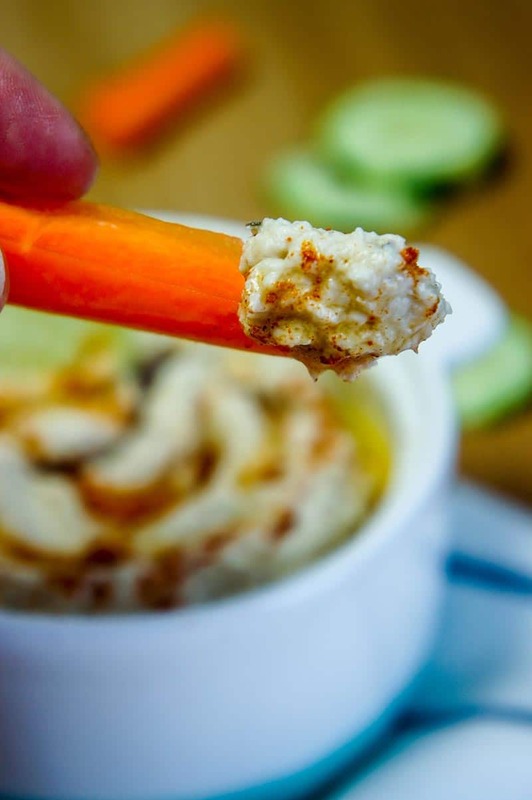 This recipe is inspired by a recipe posted on The Kitchn a few weeks ago for Cauliflower Hummus. I am a huge fan of all things cauliflower. If you are too, have you tried my Thai Ginger Fried “Rice,” or Apple Sage Chicken Meatloaf with Cauliflower Mash? I am also a huge fan of cauliflower pizza crusts– I have never posted a recipe for one, but will as soon as I perfect a cheese-less cauliflower crust. 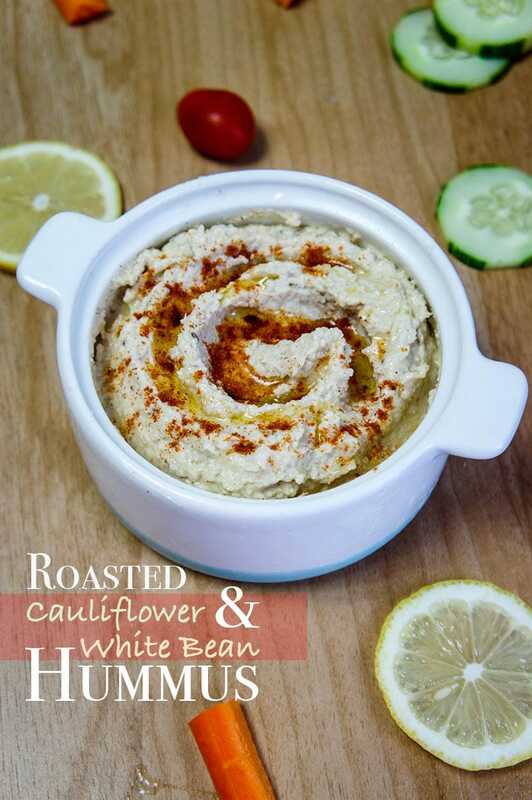 Sweet roasted cauliflower take this white bean hummus to a new level. All the traditional flavors blend with a mix of cauliflower and white bean for a unique taste on a classic recipe. On a cookie sheet, add cauliflower, and drizzle with olive oil. Season with sea salt, black pepper, and thyme. Bake cauliflower for 22 minutes, until browned and cooked very well. In a food processor, add slightly cooled cauliflower, white beans, tahini, lemon juice, and olive oil. Process for 3-5 minutes, until the mixture is very smooth. Taste, and adjust seasonings to taste. With a zester or fine grate, grate garlic clove, and mix well. Garnish with a drizzle of good olive oil (time to break out the pricey organic stuff! ), paprika, and Italian parsley, if desired. Cool completely. Serve cold with raw veggies, pita chips, or other crackers. My chickpea loving sympathy is with you dear! But any bean dip is delicious so you aren't totally deprived there! YUM! I always wish I could eat them when I see your chickpea recipes! 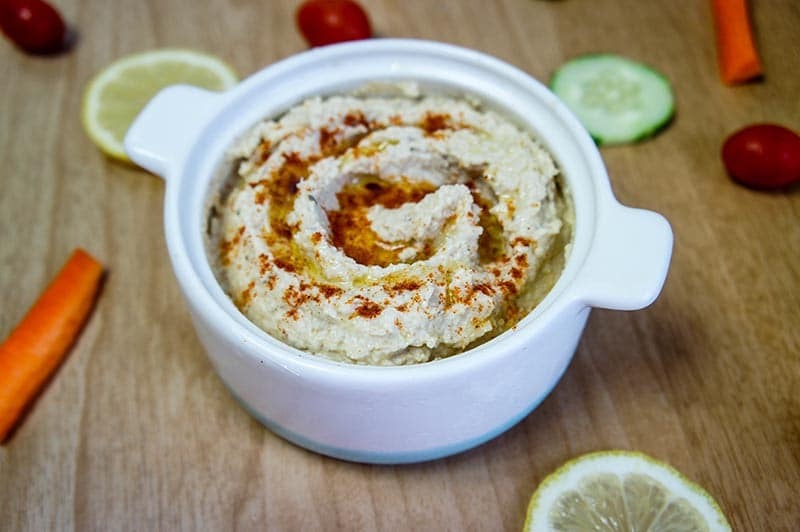 What a delicious idea and garbanzo beans is really just one of many ways to enjoy hummus. Maybe that little bambino will sort out all of your allergies magically, well I hope so at least! Pinned! I've given up on the idea of "growing out of" my allergies! I am just hoping he doesn't end up having them. It can be very restrictive-- especially when living in other countries or traveling! I love this!!!! and now you can have "hummus"!!! this one is probably better anyway! Can't wait to try this! I really enjoyed it. Thanks for such a great recipe. How long does it last? Thanks for letting me know! I love this combo too. It lasts about 1/2 a day around here... haha, joking. Keep it well refrigerated, and it will last 3-4 days. The cauliflower goes bad faster than just beans would. I took it on a plane with me, and after it got warm, it got stinky really fast! It's best super chilled.